What is it, why do we need it and how does it work? 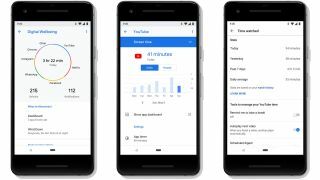 Android Pie, or Android 9, the freshest version of Google’s mobile OS has an optional Digital Wellness feature tucked away in the settings. Currently, it’s only in Beta for Pixel devices like the Pixel 2 and Pixel 2 XL, available to anyone running Android Pie who signs up for the early version. The feature looks set to be a talking point throughout 2019. After all, digital wellbeing in general is becoming a much more discussed topic, and that’s no surprise given the fact smartphone adoption is only on the up. We exercise, we watch what we eat, we think twice before walking in front of a moving vehicle. In fact, we don’t do that last one because instincts kick in. Over thousands of years, we’ve come to realize, consciously and subconsciously, that doing and not doing certain things improve our physical health and keeps us from damaging our most valuable asset - our self. By contrast to the the physical, digital technology, revolving around smartphones and encompassing our always-connected relationship with tech, is a relatively recent phenomena. Today, it’s estimated that roughly 70% of the populations of the US, UK and Australia are smartphone users, with users in the US spending an average of 3 hours 35 minutes per day on their phones. The rate of smartphone adoption has been so high, it hasn’t given science and national guidelines time to keep up. This means that we’re one giant social experiment, identifying the impact of all this tech in real time, on us, and chances are, any guidelines to follow will be reactions rather than preventative measures. It isn’t all doom and gloom, we’re better connected than ever before. Smartphones and the internet are helping us stay in touch with loved ones across the globe while ensuring we have incredible access to potentially life saving information. In the same breath, smartphones are now shaping a generation of teenagers, many of whom are addicted to apps like Snapchat and Instagram. Recent research has found links between teen depression, body dysmorphia, suicide and social media use. As for adults, everything from increased anxiety to election rigging and national revolts have been tied to smartphone adoption. Android Pie’s Digital Wellbeing dashboard is currently available to early testers, with the less official option being to sideload the APK if users are running Android 9 on a compatible device. Once installed, the feature creates a menu within the settings titled 'Digital Wellbeing'. Open it and you’ll instantly see an Android pie chart illustrating your screen-on time. This is broken down by application used as a percentage of total use, along with the number of times you have unlocked the screen and the number of notifications your phone has received in a day. In isolation, this information is just a wake up call - "Basil, you spend 30% of your smartphone time on Tinder". The pie chart itself doesn’t give you any control over your usage, just stats. As for the options below it - that is where the compulsion control lies. Below the pie chart, the first set of customization fall under the category Ways to disconnect. The first of these is the Dashboard, a screen that documents usage of specific apps with a bar chart, giving users options to limit how long specific apps can be open. If, for example, you’re addicted to left and right swipes, like I apparently am, and want to minimize the amount of time you spend on Tinder, lock it to 15-minutes. When you have five minutes remaining, you will get a notification to alert you to wrap things up and send that final message of the day. When your time is up, the app icon will go grey, you won’t be able to open the app and Tinder notifications won’t come through until the timer resets. Unless you go back into your settings and up your allotted time, that is. Below the Dashboard sub-menu is Wind Down. Similar to Quiet Hours in the latest Windows 10 Creators Update, this set of options is all about helping you chill out from night to morning. The first thing you can do here is activate Grayscale, making your screen monochromatic between these Wind Down times. The reason a black and white screen can help your digital wellbeing is down to how your brain processes color, emitted from the light from light in the display. Colors are like visual roars whereas monochromatic tones are more like whispers. Wind Down times also activate Do Not Disturb, so notifications are totally silent. In addition, the mode also enables a blue light filter from sunrise to sunset as well, helping normalize melatonin production, which could result in a sounder sleep. Current page: What is it, why do we need it and how does it work?